My recent foray into the document folder turned up bits of writing from one of my favorite blog events from Aprils past –the A to Z Challenge. They’re pretty interesting, if I do say so myself. I’ll be sharing a few until life quiets down around here. I hope you enjoy. Scroll back to read earlier From The Stacks posts. To snoozle in the shade. For the coming of the spring. So, waking up as I did with Organ Grinders on my mind, I poured my coffee and went hunting for information for today’s post. Organs themselves have a very long history and can be traced back to Ancient Greek inventor Ctesibius of Alexandria who wrote the first treatise on the science of compressed air a.k.a. pneumatics. From there he devised a hydraulos — an instrument that used the power of water to force air through pipes which were then played. Curiously, they were not used to make music as we know it. The hydraulos was used to mimic bird song. This hydraulos mechanism and the thought behind it would later become the serinette of the 1700’s — a small barrel organ that employed a crank, drop-in pins, and bellows to force air from the barrel and its small strategically placed holes through pipes. And like the hydraulos, the purpose of the serinette was to teach canaries to sing simple and particular tunes. Somewhere along the way an enterprising individual determined more pipes and pins could be added to the mechanism and actual melodies played beyond the canary tunes. This was the origin of the barrel organ the organ grinders would be known for playing it. 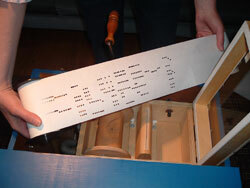 By the end of the 1800’s the barrels had been replaced by punched cardboard rolls similar to those used in mechanized weaving (Jacquard loom– also the origin of the computer punch-card). The cheap punched cardboard meant variety and variety drew larger crowds. Before I continue, it’s important to note that people often confuse the organ grinder’s instrument with the hurdy gurdy. The latter is actually a string instrument played with keys whereas the organ is a wind instrument that is run rather than played. When one pictures the organ grinder of the Victorian streets, more often that not we see a mustachioed foreigner, perhaps right off the boat that just arrived from some Italian port. It took no particular skill to turn the crank and entertain for pennies. With jobs for immigrants hard to come by, getting yourself one of these gadgets so you could go busk for coin could at least put some food in your belly. As far as the opinion of upper society went, organ grinders were little better than tinkers and gypsies. They fell in the same class as peddlers, ragmen, and circus performers. In general, how society felt about them was a mixed bag. Their itinerant nature brought news from place to place which was desired, and certainly their cheap entertainment was enjoyed by the working class. However, they were often treated with suspicion, as illustrated by Winston Churchill’s quote, and often for good reason. There are stories from the Victorian era about the organ grinders traveling with pickpocketing children who worked the crowds while the music played. And then there were the animals acts such as the monkey with the little fez who was taught to take off his hat to say thank you for the penny. Sometimes those monkeys, dogs, bears, parrots, etc attacked people. Though not as easy to come by as it was in its heyday, this street theater hasn’t died out as you might imagine. It turns up at fairs and historical events. Here’s an article about the aging organ grinders in Mexico City. 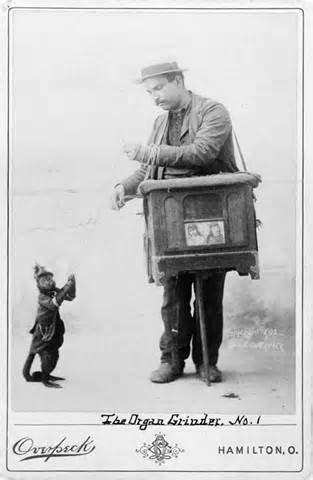 An image of a Parisian organ grinder and a very happy child doing her song and dance act. She could also be a shill to be sent out to pick pockets. The person who posted that video has a youtube channel devoted to organ grinders if you’d like to see and hear more. 😀 They make me think of summer which is good. We had snow here just the other day. One day, a goatherd tending his flock on the slope of Mount Parnassus noticed his goats bleated strangely when grazing near a certain fissure in the mountainside. Drawing nearer, he was seized by divine presence. Unknown at the time, the mechanics of this prophetic spiritual presence involved plate tectonics (the mobile rocky plates forming the earth’s surface) , namely the two that come together there and created the fissure — the Eurasian Continental Plate and the Aegean Plate. It was here along the fissure and through the porous rock that methane and ethane, two toxic hydrocarbon gasses, were released into the air. As a side note: the site was originally dedicated to Poseidon the god of earthquakes aka The Earth Shaker. This mountainside soon became one of the most important religious sites of the ancient world. A stone temple dedicated to the god Apollo was erected in a natural amphitheater. Inside the temple sat the Pythia — specially trained women who dedicated themselves to Apollo. They were the Delphic Oracles. A small alcove was built to catch the fumes from the fissure and the CO2 from the rich waters of a sacred spring deliberately channeled through the temple. After preparing her body through fasting and cleansing, she sat on her special tripod stool, breathed it all in, and soon fell into an exalted state of mind. Small wonder her body would be wracked with spasms as she fell into an altered state and responded to questions with prophetic wisdom directly inspired by Apollo himself. From this toxic trance, she gave advice. It was said at times she was spot on in her prophecy. Occasionally she babbled and didn’t make sense. Other times although her answers were clear, they went over her questioner’s head. It’s curious to note there were special days the divination was performed on. On at least one occasion the Pythia was forced from her divine schedule. Consequently, she went into seizures and died a few days later. I wonder about the significance of the schedule. How was it one day was safer than the next? The oracles spoke at Delphi for a thousand years. 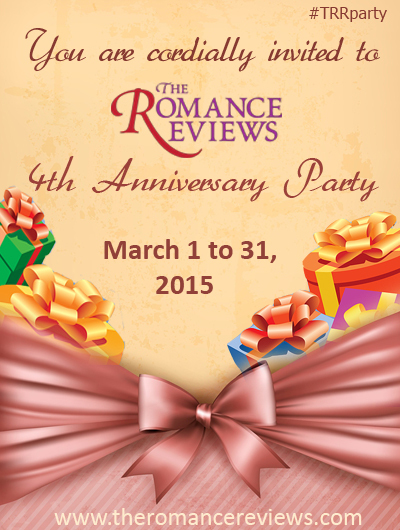 My monthly post will be up all week at Romance Books ‘4’ Us . I wrote I with a snowstorm howling outside my window, It’s about springtime with a twist. Come see! 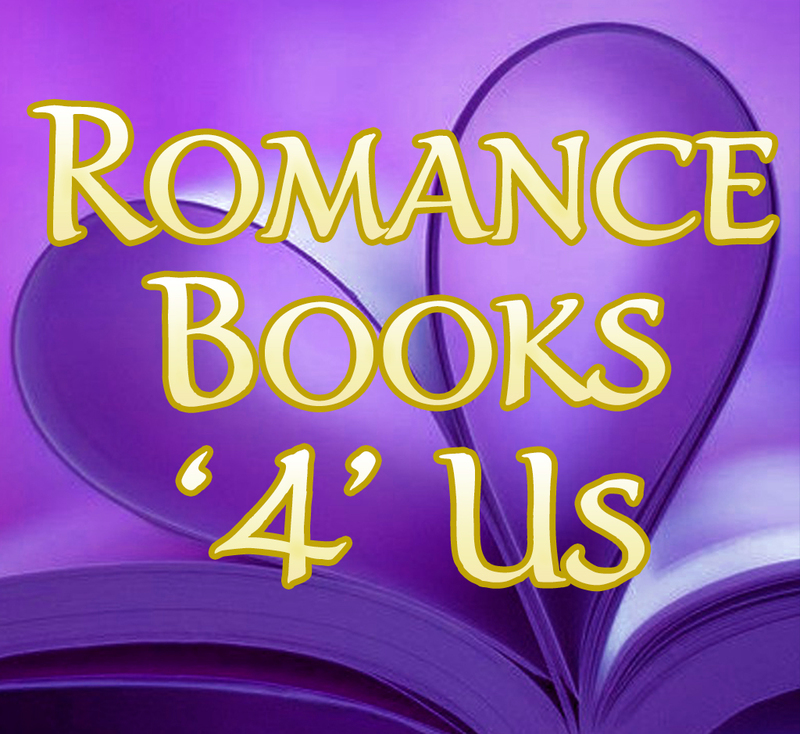 This entry was posted in Past Posts - you'll never know what you'll find and tagged #RB4U, Narcissus and Echo, Oracle at Delphi, Organ Grinder, Romance, Romance Books '4' Us, romance novels, Rose Anderson. Bookmark the permalink.